What are you basically looking for? As per the government record, 21,292 cars, jeeps and vans were registered in fiscal year 2016/2017 itself despite liquidity crunch in the year. We can see that need and demand of cars is increasing every year in Nepal. Therefore, we foresee a need of good platform to serve you all the latest and true information from automobile industry, particularly car. More importantly, Car Nepal is looking forward to provide you rental facilities in our website which shall help you to travel within Nepal without actually owning a car. We want to make your trip or journey, as hassle free as possible. Besides, we want to develop this as a strong marketplace for second hand used cars in Nepal. We want to build our own kind of Car Bazar in Nepal. However, it can take some time before we fully launch a robust marketplace. If you want to feature your product or services in our platform, do mail us. For price information of all other brands, check right hand side column of this website. If you are viewing on mobile device, keep scrollin below. Some more brands will be added to our website soon. 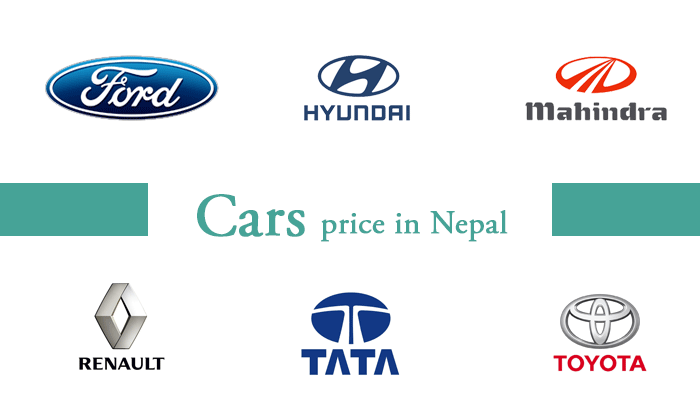 For now, check our list of car price in Nepal. Or you can check our new cars sections to search for all other available models and variants. We will also feature latest news from the car industry within Nepal and around the world. Remain attuned to our website, Facebook page or Instagram of Car Nepal for more news and updates. We will also try to feature various tips and guides in this site.